The link between tornadoes and climate change is currently unclear. It’s difficult to identify long-term trends in tornado records, which only date back to 1950 in the United States. Also, the population in many areas affected by tornadoes has grown, so it’s possible that tornadoes in the early part of the 20th century occurred without anyone seeing them. Improved technology, such as advanced radar, also helps us “see” tornadoes that may not have been detected decades ago. Another problem lies with the physics associated with tornadoes. Researchers are working to better understand how the building blocks for tornadoes – atmospheric instability and wind shear – will respond to global warming. It is likely that a warmer, moister world would allow for more frequent instability. However, it is also likely that a warmer world would lessen chances for wind shear. Climate change also could shift the timing of tornadoes or the regions that are most likely to be hit, with less of an impact on the total number of tornadoes. Adding to the difficulty, tornadoes are too geographically small to be well simulated by climate models. Models can simulate some of the conditions that contribute to forming severe thunderstorms that often spawn tornadoes. Multiple studies (see here and here) find the conditions that produce the most severe thunderstorms are likely to occur more often in a warmer world, even if the total number of thunderstorms decreases (because of fewer weak storms). However, this work does not conclusively tell us whether tornadoes should follow the same trend as their parent thunderstorms. It will remain challenging to estimate any climate change influence on tornadoes until scientists can improve their physical understanding of the processes that cause tornadoes and the observational record of tornado frequency. With low data adequacy and low/medium physical understanding of the processes that cause extreme storms, it is difficult to make statistically significant findings about trends in tornado formation. 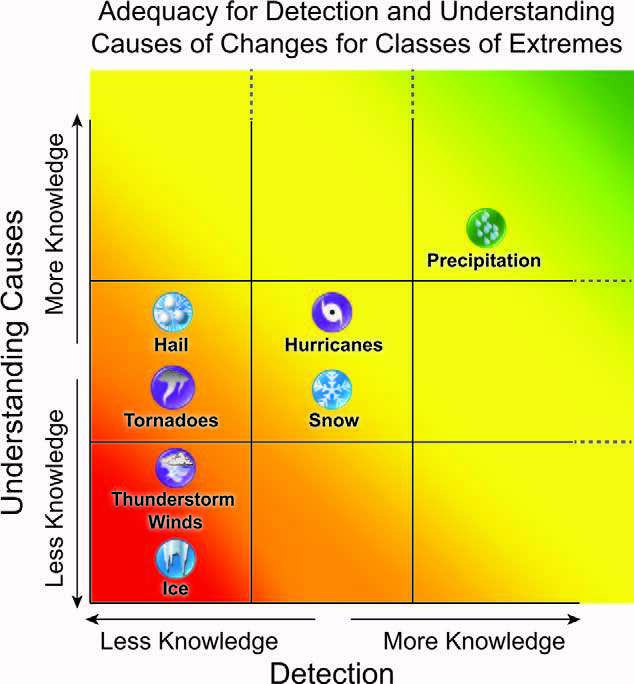 Monitoring and Understanding Trends in Extreme Storms: State of Knowledge (NOAA National Centers for Environmental Information, 2013). The most significant threats from tornadoes are the dangers posed by strong winds and debris that is caught up in those winds. Although individual tornadoes may affect a relatively small area compared to large tropical storms, they can threaten people, homes, and communities. NOAA estimates that, on average, about 1,200 tornadoes occur across the country annually, but several hundred more or fewer tornadoes can occur in any given year. The death toll from tornadoes has dropped rapidly because forecasters have more tools to detect dangerous weather and warn people to take shelter. However, tornadoes still cause billions of dollars of property damage a year. The costliest year on record for tornado damage was 2011, when seven tornado and severe weather outbreaks each caused more than $1 billion in damages, and the total damage for the year was more than $28 billion. Adopting more stringent building codes in tornado-prone areas. Continuing to support research on severe weather forecasts. Tornadoes are formed by a combination of atmospheric instability and wind shear. Instability occurs when warm, moist air is wedged under drier, cooler air aloft. This warm air rises, causing the intense updrafts and downdrafts seen in strong thunderstorms — the incubators of tornadoes. Wind shear refers to changes in wind direction and speed at different elevations in the atmosphere. The combination of instability and wind shear forms the rotating column of air that we associate with a tornado. Tornadoes that form over water are known as waterspouts.